THIS EVENT HAS PASSED. CHECK OUT OUR FULL RECAP. US Education Secretary Betsy DeVos is coming to Washington. 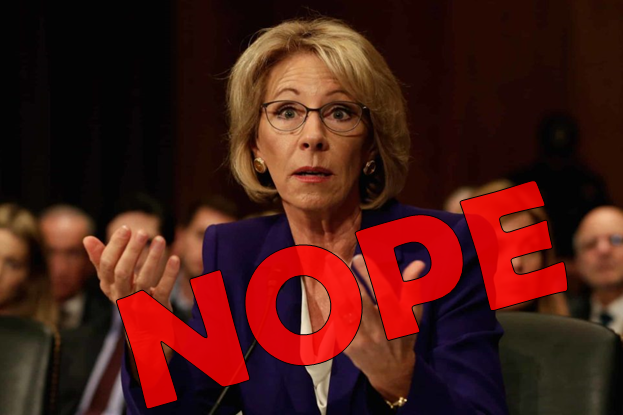 DeVos is a notorious proponent of privatizing education, eliminating the regulatory oversight of private schools funded by public dollars, and eroding America’s public education. So far in her time as Secretary, DeVos has made it a priority to disempower the Office of Civil Rights, which handles discrimination charges and protects the most marginalized of students. She has repealed protections for students repaying loans to fund their higher education. And at every chance DeVos has advocated for privatizing public education, a controversial and at many times unsuccessful mission of hers, that will serve to the detriment of students everywhere. Right now in Washington, we are on the brink of crafting a plan that will fully fund K-12 education for each and every child. This is a unique opportunity for achieving an equitable and thriving public education system – Secretary DeVos, who has only promoted privitization and its accompanying prejudices, is the last person who should be influencing our state’s education policy right now. On Friday October 13th communities who stand united in their desire for a just and robust public education system will protest Secretary DeVos’ harmful policies by staging a counter rally at the Bellevue Hyatt, where DeVos will be speaking at the Washington Policy Center’s annual dinner. For important updates, look to the event’s Facebook page. We look forward to rallying with you!